Indonesia could restart exporting nickel ore again at any time. If it does so, the dangers to seafarers will rapidly escalate. Indonesia’s ban on mineral ore exports is all that stands in the way of further bulk carrier casualties and loss of life due to the carriage of nickel ore mined in the archipelago and destined for China’s steel mills — shipping’s notorious ‘deadly trade’. Five bulkers have been lost and 81 seafarers have perished since late 2010 after loading nickel ore in Indonesia and setting sail for China. The cause of each loss was liquefaction of the cargo, a chemical process which rapidly transforms certain minerals from a solid state into a liquid sludge if loaded with excessive moisture and then subjected to vibration. Indonesia banned exports of mineral ores including nickel on 12 January, finally implementing a law passed in 2009 designed to encourage miners to construct smelters on its islands and generate value and jobs in Indonesia, rather than simply extracting the country’s resources and shipping them overseas. This prevented exports of nickel ore during the worst of this year’s wet season, which was drawing to a close as DCI went press. However, as the world’s premier miner of nickel ore and a major supplier of many other important raw materials such as copper concentrate and bauxite, Indonesian legislators are coming under considerable domestic and international pressure to overturn the export ban, a step that could again put seafarers at risk. The World Trade Organization is eyeing the legality of the ban under pressure from Japan, which sources more than half of its nickel ore from Indonesia for use in its stainless steel industry. China, which also relies heavily on Indonesia’s nickel ore, has been making noises about investing in smelting facilities in Indonesia even if it has little chance of turning a profit from doing so. In the meantime, its steel industry is desperate for the export tap be turned back on. Financial pressure to overturn the ban is also building. Indonesia’s mining minister admits that the ore export ban could result in lost export earnings of $4bn this year, hurting GDP growth and putting further pressure on the Rupiah which was in freefall for most of the last six months until it began to rally in February. Local reports also suggest that policy makers are now admitting that even though much of the value of ores such as aluminium and nickel is generated in the smelting process, banning exports alone will not automatically mean that smelters will be built. Not least this is because investors are wary of Indonesia’s woeful record when it comes to building the supporting infrastructure such as power plants, roads and ports that smelters require, especially when the plants, if built near mines, would in many cases need to be located in some of Indonesia’s most remote areas. Already some copper producers are being allowed to resume exports, albeit after agreeing to major hikes in export taxes. Analysts believe a similar fudge could see a resumption of exports of other minerals, including nickel ore.
With stockpiles of nickel ore high and miners and buyers desperate for supplies, even a temporary resumption could see a surge in exports. This could prove particularly dangerous for seafarers if this happens during the wet season, which usually starts in Indonesia around September/October. The most recent casualty on the Indonesia–China nickel ore trade occurred in February 2013 when the 49,675dwt Panama- flagged, Rina-classed, Harita Bauxite sank with the loss of 15 lives after loading nickel ore at Obi Island during heavy rain. It took more than a year for the Panama Maritime Authority to confirm that liquefaction of the cargo was almost certainly the cause of the loss. Since the Harita Bauxite tragedy there has been scant sign of any action on the ground in Indonesia to improve safety at load ports, or improve access for cargo inspectors, while progress aimed at making handling processes safer via legislation has been glacial. The IMO is now pushing Member States to implement amendments to the International Maritime Solid Bulk Cargoes (IMSBC) Code, which include new rules for handling nickel ore, as soon as possible. The amendments are designed to tighten up the loading and testing procedures for cargoes such as nickel ore which may liquefy, not least by ensuring that strictures on Transportable Moisture Limits (TML) are adhered to and testing of the cargo before loading is comprehensive. The amendments include the following welcome statement:“When a concentrate or other cargo which may liquefy is carried, the shipper shall provide the ship’s master or his representative with a signed certificate of the TML, and a signed certificate or declaration of the moisture content, each issued by an entity recognized by the Competent Authority of the port of loading.” The entry-into-force date of the amendments is expected to be 1 January 2015. However, exactly how this will help in Indonesia’s more remote loading spots where masters and inspectors are often subject to intimidation, testing facilities are not available and shipper declarations cannot be trusted, is not yet clear. If exports of nickel ore fines from Indonesia do resume in the coming months, much of the safety onus will remain on vessel masters. The investigation report by Panama Maritime Authority into the loss of the Harita Bauxite obtained by DCI sheds some light on how difficult a job this can be. Investigators found that the cargo presented for loading after prolonged bouts of heavy rain was not in accordance with the International Maritime Solid Bulk Cargoes Code of 2012. PMA concluded that the probable cause of the accident was the liquefaction of the nickel ore cargo inside the cargo holds. “The flow state of the nickel ore cargo might have developed a list to the vessel and caused it to capsize and sink,” said the report. “In addition, stopping the vessel at night mainly due to a no.3 generator problem could not be understood considering the vessel was equipped with three generators. The report recommended that all vessel stakeholders should issue clearer rules and duties on how cargoes such as nickel ore are loaded and tested for moisture levels, and the master should not allow loading to commence “until he is in possession of all requisite cargo information and documentation/certificates that a shipper is obliged to provide under the Code or local regulations,” even in areas where obtaining accurate shipper declarations relating to the cargo is difficult. The report also “strongly” advocated use of an independent cargo surveyor to check and report both the Transportable Moisture Limit and the actual moisture content prior to loading. “It is highly advisable that owners and charterer should not rely just on a single point of submitted information, especially mine owner in-house laboratories,” said the report, adding that this should remain the case even if awaiting adequate test results leads to significant delays. “Loading should not commence until the test results have been received and the expert is satisfied that the cargo is safe for shipment,” it said. He said that despite recent and welcome additions to the IMO’s Global Integrated Shipping Information System database of accident reports, Intercargo remained very concerned that some flag states were ignoring their moral and legal responsibilities concerning the investigation of some serious casualties. “The need to investigate and act upon the recommendations of maritime accident reports provides a vitally important role in improving the safety of the maritime industry,” he said. To help address the issue, Intercargo has now formed a Casualty Correspondence Group amongst its membership which considers casualty reports and recommendations in order to enhance the learning experience for bulk carrier owners and operators. He said some casualty reports that were on GISIS were “nothing more than a perfunctory analysis” of the factual circumstances in which the incident occurred. “Clearly all flag states — and where appropriate to the casualty and its circumstances, some coastal states — have different methods of meeting IMO obligations for investigating maritime casualties,” he said. Intercargo would like to see Casualty Reports publicly accessible on Flag State websites. DNV GL and Shanghai Merchant Ship Design & Research Institute (SDARI) have introduced the Green Dolphin 575 concept design for a Handymax bulk carrier. This second design builds on the success of the Handysize Green Dolphin 38 for which around 80 orders have been placed with the major share to DNV GL class. Green Dolphin 575 aims to be fuel and energy efficient, robust and reliable, operationally flexible and able to meet current and future environmental regulations — and improve overall safety. It uses technologies that are already available for commercial use, so it can meet ship owners’ current needs in tight market conditions. The Green Dolphin 575 is a 190m-long Common Structural Rules (CSR)-compliant Handymax bulk carrier with five cargo holds. It is available in single hull standard or double-hull (open hatch) configurations. Engine configuration and emission-reduction technologies have been carefully evaluated, says Aasland. The Green Dolphin 575 is designed to comply with current and future expected local and global emission regulations through several different alternatives: a switch to low-sulphur fuels, the installation of exhaust-gas cleaning systems or dual-fuel operation with LNG. The core design has an efficient Tier II long-stroke, low-speed main engine and a large-diameter slow-rotating propeller. As a result, main engine fuel consumption is about 22.8 tonnes/day at CSR condition with a 15% sea margin. The vessel is prepared for cold ironing, and cargo handling operations are performed by four energy efficient electric deck cranes with variable frequency drives that reduce energy consumption, are non-polluting and maintenance- friendly. Other features include a citadel for crew protection and compliance with the revised code on noise levels on board ships. UK company Cygnus Instruments Ltd was founded in 1983, when it first pioneered the digital multiple echo technique which is used to obtain accurate metal thickness measurements through coatings. With successful diversification, Cygnus now carries three ultrasonic product lines — thickness gauges, hatch cover/water-tight door leak detector & industrial leak detectors. This article will focus on the company’s Hatch Sure product, which offers high-quality ultrasonic hatch cover leak detection. Hatch covers can slide forwards, backwards, or to the side, lift up or fold up. It is essential that they be watertight: unsealed hatches lead to accidental cargo hold flooding, which has caused many bulkers to sink. Regulations regarding hatch covers have evolved since the investigation following the loss of the Derbyshire in 1980. The vessel foundered during ‘Typhoon Orchid’, south of Japan, and all hands (42 crew and two women married to crew members) were lost. At 91,655dwt she was — and remains — the largest British ship ever to have been lost at sea. The Load Line Conference of 1966 imposed a requirement that hatch covers be able to withstand load of 1.74 tonnes/m2 due to sea water, and a minimum scantling of 6mm for the tops of the hatch covers. The International Association of Classification Societies then increased this strength standard by creating its Unified Requirement S21 in 1998. This standard requires that the pressure due to sea water be calculated as a function of freeboard and speed, especially for hatch covers located on the forward portion of the ship. Cygnus Instruments produces an ultrasonic hatch cover leak detector — Cygnus Hatch Sure — for testing weather tightness of cargo hatch covers. The equipment provides a quick and effective method of evaluating hatch seals and aiding the prevention of sea water ingress. Sea water ingress is one of the major sources of damage to cargo, resulting in expensive insurance claims. As noted above, it can also lead to flooded cargo holds and present a major risk to the safety of the vessel and its crew. Cygnus Hatch Sure provides a quick and effective method of evaluating hatch seals. The system consists of a battery powered variable output transmitter containing 19 ultrasound emitters (40kHz). The emitters are arranged to produce an omni-directional sound field, uniformly distributed throughout the cargo hold. The receiver part of the system displays the sound energy level that passes through gaps in the enclosed cargo hold to	use; enable the location of leaks to be quickly and accurately identified. Hatch Sure is ABS type approved and accepted by P&I clubs. Warwick Norman, CEO of ship vetting expert Rightship, believes in a holistic approach to bulk carrier safety. DCI: How many ships are you vetting each year now and how many of them are bulkers? Norman: We did about 34,000 vets last year. About two thirds were bulk carriers and general cargo ships and one third were for the petroleum sector. The number of bulk carriers we vetted last year increased by 7%. We also vet some containers, mainly where people are moving high value cargoes such as uranium in containers and need to assess the ship first for obvious safety reasons. DCI: Who are the main customers using your bulk carrier services? Norman: Our main bulk carrier customers are charterers and shippers. The latter may be selling FOB [free on board], but may have assets in the terminal even if they are not doing freight, or they may be protecting all the various stakeholders in the export chain by ensuring the ship is safe before it is loaded. In Australia, our customers are the west coast iron ore terminals and coal terminals on the east coast. We also vet bulkers on the South American iron ore trade as well as those carrying Central American and Indonesia coal. DCI: Once you have vetted a vessel via your Ship Vetting Information System, how often does this then lead to a physical inspection of the ship by your vetting team? Norman: We tend to do about 3,000 physical inspections globally each year. So about 1 in 10 or 11 of the ships we vet subsequently gets inspected. 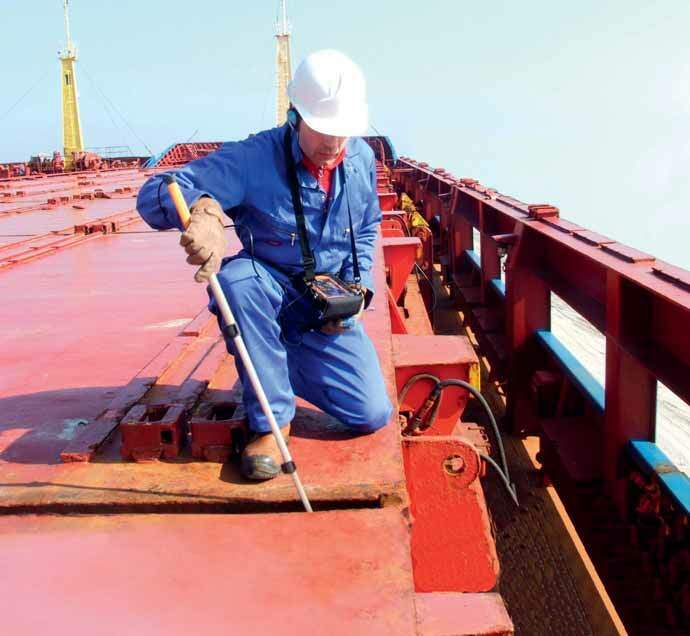 DCI: At what point does Rightship decide a ship needs to be inspected? Norman: It’s a hierarchical process whereby we look at various factors and work through the total risk. If the ship is old — maybe it’s over 18 years old if it’s a bulker — then that’s when we’d look at doing an inspection, for example. Statistically the risk curve increases for a bulk carrier from 15 years onwards in terms of detentions and incidents or Port State Control [PSC] performance. Other factors would be warning signs such as a ship’s involvement in a casualty, something that comes up in PSC, or perhaps if it has changed its name. DCI: What are you looking for during the inspection? Norman: We take a holistic view. There is a lot involved in safety across the vessel. We make sure all the management systems are in place and running properly on the vessel. We also look at traditional risk issues around fire fighting and life- saving machinery. We also look into the effectiveness of the management system from top to bottom because incidents are usually down to human error. We try to make sure vessel owners have everything in place to minimize their exposure to human error. DCI: Is the shipping lane or cargo to be carried a factor in your analysis? Norman: Yes, it can be. For example, some customers might look specifically at watertight hatches if they are moving grain cargoes. Or if they are chartering a vessel for a long period they may have particular concerns they want us to check out. But generally we take a standard approach to the inspection process. DCI: What is the process by which you issue a report after an inspection? Norman: We have a team of inspectors that conduct the inspection and then produce the report. But they don’t make a subjective call on whether it’s fit for service, that’s handled by Rightship. Our team in Melbourne reviews the report, then we liaise with the owner and look to work through deficiencies to rectify anything that’s come up. Deficiencies that are considered to be of a serious nature and a safety or environmental risk are reported to the relevant classification society or flag by the ship owner for review. When class or flag are satisfied with the action taken by the ship owner to close the deficiency, evidence will be provided to RightShip. This is then recorded in the system against that vessel. DCI: Have you added any new services recently? Norman: Yes, we’re no longer just doing safety and quality, we’re also looking at ship efficiency and emissions. We’ve had a significant uptake on our Greenhouse Gas Emissions Rating service and we now have 22 customers, entities that represent some 1.7 billion tonnes of cargo, which is around 23% of global non-containerized shipments through 21,500 vessel movements annually. Our GHG Emissions Rating is also used at ports such as Port Metro Vancouver and Prince Rupert Port Authority which charge lower port fees for more efficient vessels and we are currently in discussion with several other ports around the world. The early adopters have significant first mover advantage and the feedback has been positive with reduced shipping costs through reduced bunkers, enhanced reputations and support of sustainability objectives. We’ve also been updating our technology by using Big Data techniques based on actuarial analysis. This is more advanced predictive analysis technology for vetting and we’re the only company using it. This will help us identify substandard performance far better, it’s very sophisticated. We’re also refreshing our online interface to provide a better platform for our customers as well. DCI: Are there any specific or new dangers that you are keeping an eye on in terms of bulk carrier operations? Norman: In terms of casualty figures and losses, yes, the liquefaction of nickel ore loaded in Indonesia is an issue. We share industry concern over the loss of vessels and lives due to these dangerous cargoes being loaded incorrectly. If exports from Indonesia resume after the recent ban, our message to owners is to take extreme care and to make sure contractually you have independent surveyors verifying the moisture content. The master should have the power to reject the cargo if he’s not happy with it and the company should be on the ground for the inspectors. If access for inspectors is blocked then don’t load the cargo, it’s not worth the risk.